Bond Street, stretching from Broadway to the Bowery, became perhaps the most exclusive address in Manhattan in the 1820s and 30s. As historian Sturges S. Dunham explained nearly a century later, in 1917, "Bond Street was one of the best known streets in the city and none stood higher in favor as a place of residence." No. 31 Bond Street was built in 1827. The 26-foot wide mansion was faced in red brick and trimmed in marble. 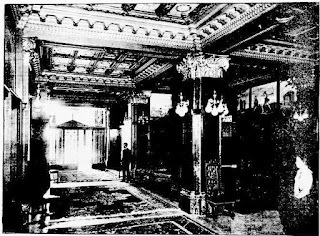 Three stories tall above a rusticated basement, it boasted handsome carved lentils, an arched double-doored entrance with a Gibbs surround, and wrought iron stoop newels which perched on paneled marble pedestals. It became home to wealthy builder Timothy Woodruff within the year; however his stay here was short. He moved to No. 29 First Street in 1829. Mary Sutherland, the widow of Dr. Talmadge Sutherland, moved in and remained for a decade. The next resident, William Waring, also stayed for about ten years. By 1850 changes were occurring on Bond Street. While still mostly upscale, many of its wealthiest residents were moving northward to Murray Hill and Fifth Avenue. Within the decade Bond Street would have the greatest concentration of dentist offices in the city. The New York Times described No. 31 Bond Street saying "It is of brick, with marble stoop, four stories high, and differs not materially from the rest of the buildings on the same block, all of which are several years old, and were in their day first-class and fashionable, now simply genteel." In 1851 dentist Dr. John Lovejoy occupied No. 31 Bond Street. 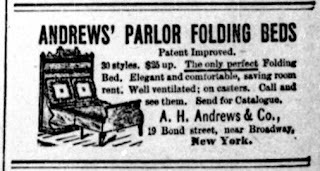 Then, on May 23, 1853 an advertisement appeared in The New York Herald announced "A. T. Smith, late with Dr. C. S. Rowell, begs to inform his friends and the public that his office is at No. 31 Bond street, where he will continue the practice of dentistry in all its various branches." Dr. Smith performed his dental office downstairs--touting "artificial teeth inserted, from one to a full set, on the most approved principles, in a superior style, and on the most reasonable terms"--while the upper floors were operated as an upscale boarding house. An advertisement in The New York Herald on April 26, 1854 offered "a very desirable location, where can be obtained a few elegant parlors and bedrooms, furnished or unfurnished, with partial board or without board...with hot and cold water on each floor, gas, bath, and all the modern improvements; they will be let to gentlemen who are willing to pay a fair price in advance. None others need apply." Like Dr. Lovejoy before him, Dr. A. T. Smith was here briefly. In June 1855 he moved his practice to No. 306 Fourth Street, and the house was sold to another dentist, Dr. Harvey Burdell. It was valued at $30,000 at the time; about $850,000 in 2016. Burdell was born near Herkimer, New York in 1812. By now he was well-established and wealthy (he also owned the house at No. 2 Bond Street). But neither his successful career or his wealth could overshadow his unpleasant character. Writing in The Era Magazine in 1905, Will M. Clemens said of him "He was quarrelsome, penurious, greedy of appetite and fond of the company of women. He was often sued by women, and frequently appeared in one court or another. He was eccentric. He disliked men, but was very fond of guinea pigs." Twice Burdell had been engaged to be married; and twice his repellent personality capsized the plans. In 1835 his engagement to a wealthy heiress was broken after he planted his fist in her father's eye. He later was to be married to the daughter of a rich businessman. But, as described by Clemens, "On the day set for the wedding, and in the presence of the clergyman and guests, Dr. Burdell flew into a passion because the father of the girl would not give to him before the ceremony a check for $20,000. The wedding was off. The girl married Burdell's groomsman and the latter then pocketed the $20,000 check." Burdell moved into No. 31 Bond Street, established his practice there, and like Smith, rented rooms on the upper floors. It was no doubt his excoriating demeanor which lead to the rapid procession of women who ran the boarding house--Mrs. Conway, then Mrs. Brulin, and Mrs. Jones who operated it in the early part of 1856. Several of those rooms were occupied by Burdell's acquaintances (he was reportedly of "few friends" but had "a large acquaintance among persons of questionable character). 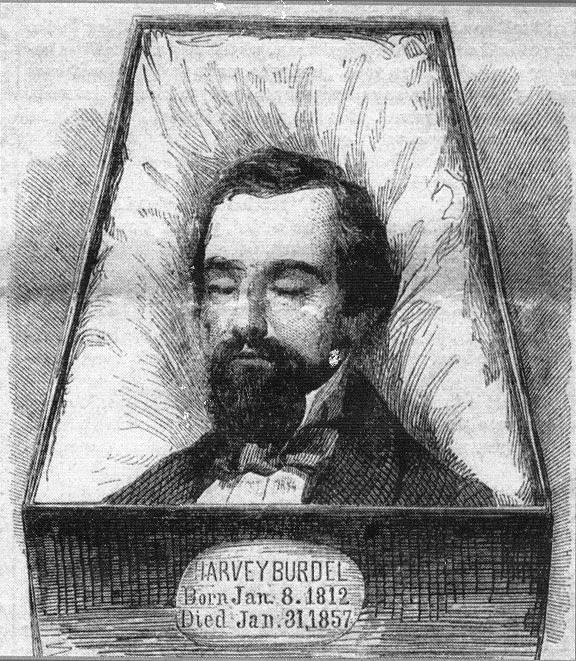 Despite his disposition, Dr. Burdell was a prominent member of the New York Historical Society and a director in the Artisan's Bank. Described as "a fine looking man, well proportioned, and of singularly youthful appearance," he owned country properties in New Jersey and Herkimer County, New York, and was the author of several books on dentistry. Around the time that Burdell took over No. 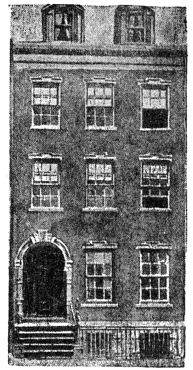 31 Bond Street, he hired Mrs. Emma Augusta Cunningham as his housekeeper. She was the widow of a wealthy Brooklyn distiller and had two adult daughters, Margaret Augusta and Helen. The dentist and the housekeeper were equally matched, in terms of temperament. They quarreled and he fired her; but she and her daughters came back in 1855. It was a fatal decision on the doctor's part. Will M. Clemens wrote "The front and back parlors on the first floor were used as reception rooms and were richly furnished. On the second floor the front room was occupied by Dr. Burdell as his sleeping apartment and the rear room was his dental office and operating room, it measured fifteen by twenty feet." In May 1856, after Mrs. Jones left, Emma operated the boarding house upstairs. One of the residents of No. 31 Bond Street was John J. Eckel. Described as "a big man, physically, preferring the society of women and fond of food," he, like Burdell, had a bad temper. He was the lover of Emma Cunningham and had previously resided with her in various places. Another roomer was George Vail Snodgrass, 18 years old. He too, professed his love for Mrs. Cunningham. Clemens remarked "She petted him and kept him always about her." Other boarders included Daniel Ullman, a lawyer; and Hannah Conlan, a cook. The first signs of serious trouble came in December 1856 when Burdell ordered Emma to "vacate the house with her train." The two argued, and a few days later the dentist walked a potential new proprietor for the boarding house through the premises. This was one battle that Dr. Harvey Burdell would not win. On March 2, 1857 The New York Times ran the headlines "Dr. Harvey Burdell Assassinated in his own Office in Bond-Street. Frightful Mutilation of The Body." At 8:30 on the morning of Saturday, February 28, Burdell's errand boy had arrived as usual. He found the dentist on the floor, "shockingly mutilated," in a pool of blood. The doors and walls of the room were blood-splattered. Dr. John W. Frances, who lived nearby, was summoned. "He found that Dr. Burdell had been strangled by a ligature applied around the throat, and that no less than fifteen deep wounds, almost any of which would cause death, had been afflicted with some sharp instrument on his person." The grisly details of the condition of the body and the crime scene were reported in gruesome detail in the daily papers. Police Captain Francis Speight described the scene as "a veritable slaughter-house." On February 2 The New York Herald wrote "The Bond street tragedy continues to be the all-absorbing topic of conversation. 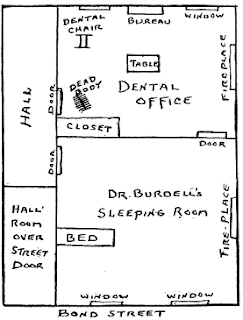 The shocking death of Dr. Burdell was spoken of in every circle." The article noted that both Snodgrass and Eckel were being held at the 15th Ward Station House, "although it does not yet appear that they know anything concerning the dreadful tragedy." Bond Street was thronged with about 2,000 curiosity seekers on the morning of the funeral, March 5, 1857. The Times reported "Among these were individuals of all degrees of society. The rowdy, of course, was there; everybody who was idle was there; but there were other who never attend any demonstration of a kindred nature unless something very extraordinary or exceedingly peculiar characterizes the incident." Following the Grace Church services, the body was taken to Brooklyn's Greenwood Cemetery, where reporters were treated to a bizarre incident. A woman named Williams, who said she was a relative of Dr. Burdell, entered the reporters' carriage and stated that she had chosen the burial plot herself. She lashed out at Emma Cunningham, saying loudly "The doctor's sentiments towards Mrs. Cunningham were well known to his friends--that he always expressed the utmost aversion to her, and, to use his own words, would rather be torn in pieces with hot pincers than marry her." She then reported that the dentist had made a will about a year earlier and that she thought "it probable that the same will had been either stolen or altered." 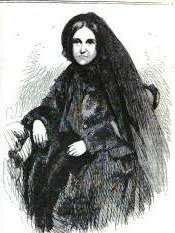 Her protests were in reaction to Emma Cunningham's testimony at the coroner's inquest that on October 25, 1856 she and Burdell had been secretly married. The Era Magazine later wrote "Scandal and gossip dwelt on the story that Dr. Burdell's landlady, the buxom Mrs. Cunningham, had sustained the relation of mistress to him, that she claimed to have been secretly married to him, that she was unscrupulous and strong-minded enough to engage in an intrigue against his fortune if not his person, and that the house, though respectable and aristocratic externally, was within the scene of continual bickerings, hostilities, jealousies and schemes--of espionage through keyholes, of larcenies of papers, of suspicions among servants, of quarrels in the entries and indecorums in the chambers." Later testimony by The Rev. 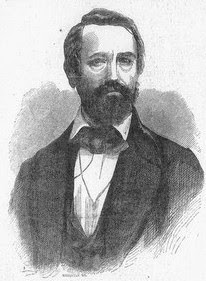 Mr. Marvine, who performed the Burdell-Cunningham marriage, drew more suspicion than conclusion. He was unable to identify either Burdell (whose body he had viewed) nor Emma Cunningham as the two he had married. But he was certain that Emma's daughter, Augusta, had been one of the witnesses. He added "that as the party left the house the supposed Mrs. Burdell requested that no publication be made of the marriage." The courts set about liquidating Burdell's properties. On March 30 a public auction of the furnishings and dental equipment was held in the house. The New York Herald noted that for weeks "a crowd stood gaping at the premises No. 31 Bond street, anxiously desiring to get a view of the interior of the house in which such a strange and fiend-like tragedy had been enacted." The stream of people who filed through the house were less interested in the items offered than in ghoulish curiosity. 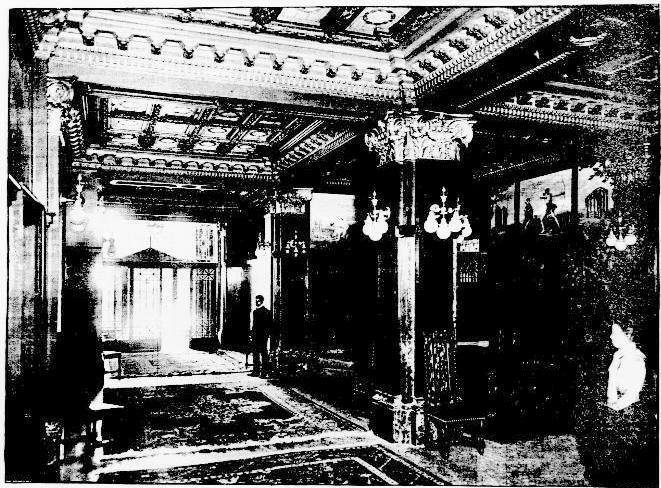 "The back room on the second floor, the walls and doors of which are still besplattered with the blood of the deceased, was the central point of attraction," noted the Herald. The newspaper dared to say what went through the minds of many. 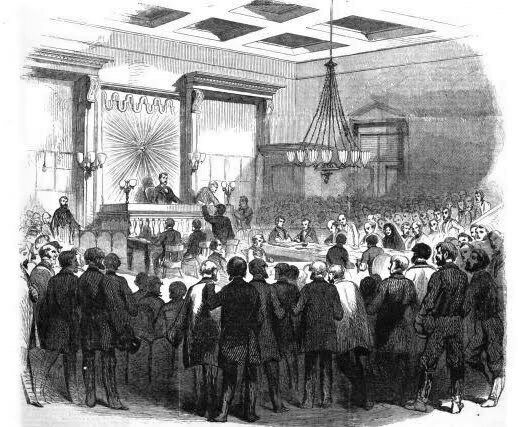 Mentioning that the Cunningham daughters were in the house, it wrote "Who can say during the hours the live throng was so actively engaged beneath them, what thoughts may have filled their breasts, what relenting, what forebodings may have burdened their hearts, if guilty of connivance at the murder?" The items auctioned off reflected the wealth of the murdered dentist. Oil paintings, velvet carpets, mahogany furniture, and chandeliers were sold. But newspaper readers had not heard the last of Emma Cunningham. She had begun laying claim to Burdell's $100,000 estate even while in prison. She summoned Dr. David Uhl to her cell, saying she had symptoms of pregnancy. Then on Monday night, August 5, 1897, an unknown man called on Dr. Uhl to come to the rooms where Emma was staying. Another doctor was already there and the room was darkened. Emma was contorting under bloody sheets, "and in due time, after considerable groaning and moaning, the expectant heir was brought forth," reported the New-York Daily Tribune. "Dr. Uhl left the house and the case to the charge of others, who were on hand at the door." On September 15 The New York Times reported "The fictitious baby at Barnum's did not prove attractive yesterday...and people also began to think, as one lady visitor remarked, that there was no difference between Mrs. Cunningham's bogus baby and other babies." The comment was spurred by the recent revelation that Emma Cunningham had "borrowed" the infant from an orphanage operated by the Sisters of Charity, and the attending doctor who "delivered" the child was an accomplice. Testimony revealed he had doused the bed with a pail of blood before Dr. Uhl's arrival. Emma, her cohort and her two daughters were arrested in what the New-York Daily Tribune called "a plot so audacious and so deliberately carried out that it looks more like the romantic invention of a novel writer than the sober reality of actual experience." While the astonishing story played out, Dr. Burdell's brother, also a dentist, had moved his practice into the Bond Street house. Dr. Lewis Burdell shared the the office space with a Dr. Wilson. Just as public attention to No. 31 was waning, fire broke out at around 12:30 on the afternoon of April 20, 1858. Although the blaze, which originated in a defective kitchen range, was quickly extinguished and little damaged was sustained, the New-York Daily Tribune noted that it was "the cause of no little excitement in the neighborhood." In January 1861 Lewis Burdell sold the house for $17,050. Despite its tainted reputation, the new owner continued operating a boarding house here, advertising "a large parlor, suitable for a gentleman and wife" on May 1, 1866. But public attention returned to the address on October 6, 1869 when The New York Herald ran the headline "ANOTHER BOND STREET HORROR--A Man Found Dead in the Burdell-Cunningham House." John B. Felton, a distillery worker, had boarded in the house for some time. On Sunday evening, October 3, he had gone to his room in the rear of the building. The Herald reported "Nothing strange, however, was thought of the matter till yesterday morning, when a very oppressive odor throughout the house was detected, and an examination showed that it proceeded from Felton's room." Although doctors were unable to ascertain the cause of death immediately, the mysterious death in the murder house was irresistible fodder for the press. On August 25, 1888 A. Wolff of the banking firm of Kuhn, Loeb & Co. announced that he had commissioned architects De Lemos & Cordes to design a six-story store building at No. 31 Bond Street. It was the end of the line for the once-elegant mansion and one of the most notorious murder mysteries of the 19th century. As for the players in that affair, the disgraced Emma Augustus Cunningham had gone to California. She returned to New York in 1884 and died penniless in Harlem on September 13, 1887. She was buried, ironically, in the same cemetery as Dr. Harvey Burdell. John J. Eckel died in 1869 in the Albany Penitentiary where he was serving a sentence for "whisky frauds;" and George died in Brooklyn in 1872. The sensational Burdell murder case was never solved. On February 1, 1913 Warren & Wetmore's magnificent, $35 million Grand Central Terminal was completed. Almost. Included in the architects' design was a monumental sculptural grouping and clock. Rising above the uppermost cornice, it would serve as the crowning touch to the sumptuous structure. 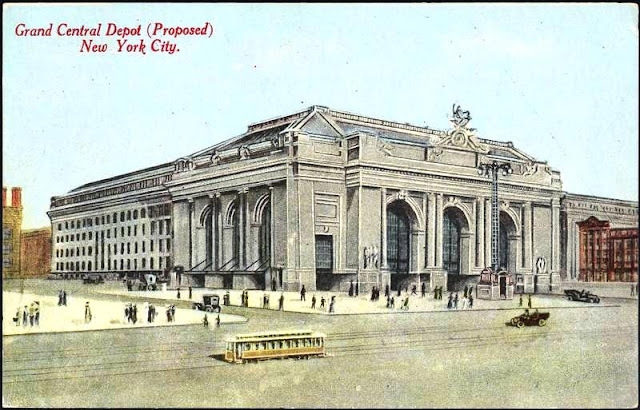 A postcard, depicting the proposed terminal, made a stab in the dark at the possible clock and sculpture. Paris sculptor Jules-Felix Coutan had won the commission for the group. Coutan was well-chosen for the Beaux-Arts style work. He had recently completed the sculpture France of the Renaissance for the exuberant Alexander III Bridge in Paris. When the new Grand Central opened, Coutan was still at work in his Paris studio on the group entitled Transportation. His finished model, one-quarter sized, finally arrived at the stone yards of William Bradley & Son in Long Island City over a year later, in May 1914. There the architectural sculpture firm of John Donnelly set to work recreating the limestone figures in full size. Among the firm's sculptors working on the project was Oliver N. Burdett, whose work also appears on significant buildings like the Morgan Library and New York Public Library. The massive scale of the grouping, touted by The New York Times on June 14, 1914 as "World's Largest Sculpture Group," required the work to be completed in sections and pieced together. The article explained "The group...is constructed like the front of a building; that is, it is built up in continuous layers of stone cemented together." The work, 50 feet tall and 60 feet wide, would weigh over 1,000 tons on completion. 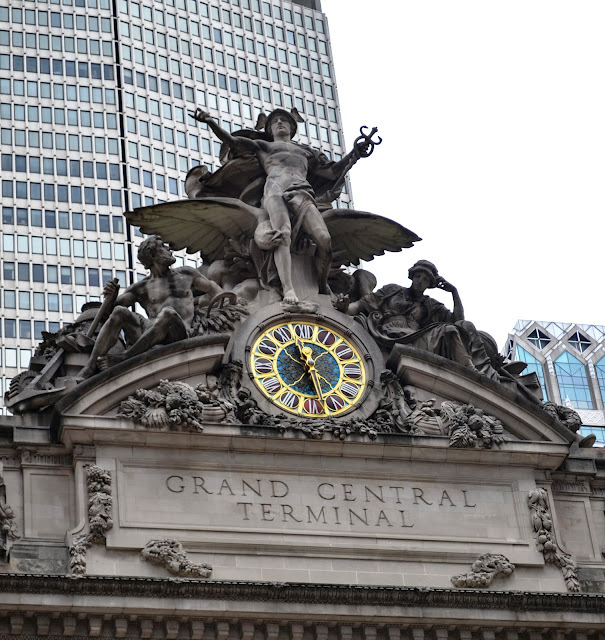 Designed to embrace the massive clock--crucial to an early 20th century train station--it was surmounted by a figure of Mercury, messenger of the gods as well as the god of travel, speed and commerce. To his right reclined the figure of Hercules, who symbolized strength. Coutan depicted the god with a less-brawny physique than expected. The Times noted he "is surrounded by objects familiar in daily life. Here are the cogwheel, the anchor, the anvil, and the beehive. Also there are sheaves of wheat, and branches of oak." Coutan's intention was, apparently, to focus less on Hercules' musculature so as to give him a more commercial and domestic focus. "If the figure of Hercules is indicative of strength and action, that of Minerva, on the other side of the central figure, typifies thought and study," explained the article. About two weeks before the group's completion, Walter Roberts of William Bradley & Son described the figures to a New York Times journalist. Leading him to a huge unworked block of limestone, he said "This is a head for the lady over there, Minerva. It weighs some fourteen tons. We hope to get out of it also her curls and ornaments. And that block of stone coming down the shop on the overhead crane is a little memorandum, a book or scroll, which she may peruse during the rest of her life." Mercury was being worked on in two sections. "Up to the waist line we are building him on this side of the shop, and on the other we are taking care of the rest of him." The Times told its readers "Mercury will stand with right hand extended and holding in his left the magic wand said to exercise influence over living and dead, and to bestow wealth and prosperity." Behind Mercury, an immense eagle spread its wings, extending its rather threatening head around the god's right leg. John Donnelly and William Bradley & Son completed the monumental task within six weeks of receiving the plaster model. Installed above the Park Avenue entrance, the figures surmounted a broken pediment which embraced the gigantic Tiffany glass-faced clock. At 13 feet in diameter it remains the largest example of Tiffany glass in the world. On either side of the clock, cornucopias spilled sumptuous fruits and grains over the ledge. Throughout the subsequent decades Transportation became alternatively known as the Glory of Commerce. This is possibly because of one magazine account which identified Hercules as depicting "moral energy," Minerva as "mental energy," and Mercury as "symbolizing the glory of commerce." 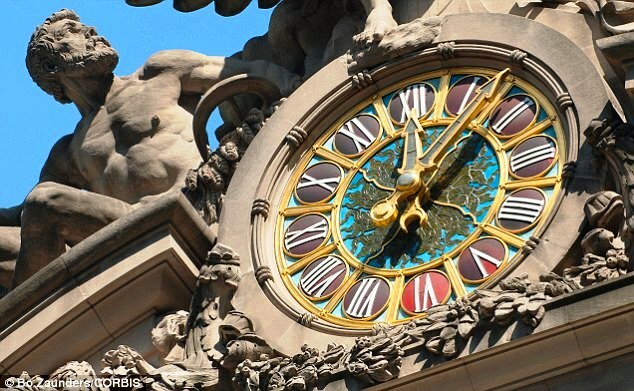 The clock, the sculptures and the building itself were threatened several times in the 20th century. In 1954 William Zeckendorf hired architect I. M. Pei to design an proposed 80-story structure on the site. Pei's concept was a somewhat hour-glass shaped skyscraper. And although in 1963 the Pan Am Building replaced the six-story Terminal office building; the main structure survived. 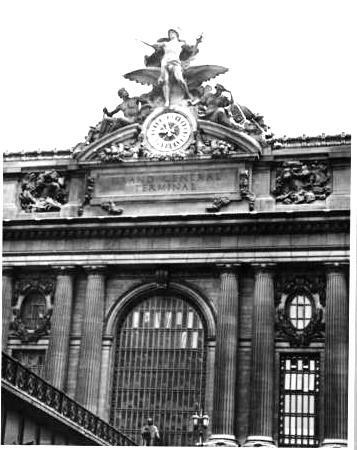 Jacqueline Kennedy Onassis was highly instrumental in thwarting Penn Central's 1968 plans to erect an office tower on top of Grand Central. Among her arguments, she said "Is it not cruel to let our city die by degrees, stripped of all her proud monuments, until there will be nothing left of all her history and beauty to inspire our children?" Grand Central was designated a New York City monument, saving the building. In 1992 a complete restoration of the soot-blackened building was initiated. Included in the 12-year project was the dismantling and restoration of the Tiffany Glass clock by Rohlf's Stained & Leaded Glass of Mount Vernon, New York. 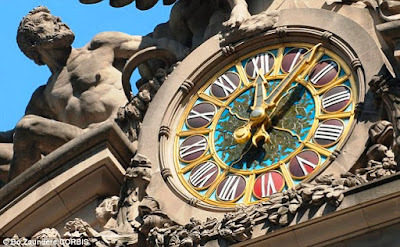 The studio replicated damaged or missing pieces, cleaned the existing elements, and reinstalled the restored clock face. Today, as it was in 1914, the monumental sculptural group and clock are the focal point of one of Manhattan's most recognizable landmarks. Despite his storming off to England with his family in 1891--the result of a heated feud with his aunt, Caroline Schermerhorn Astor and contentious business relations with his cousin, John Jacob Astor--William Waldorf Astor continued to conduct business in New York. 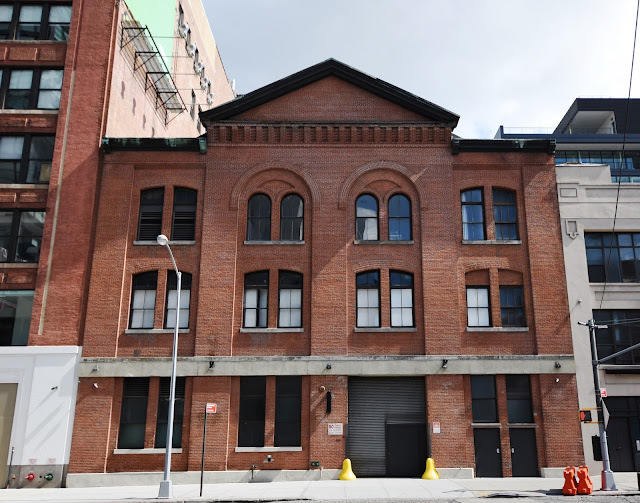 He had inherited a significant amount of property on the west side dock area, and on June 14, 1892 The Real Estate Record & Builders' Guide reported his intentions to erect a brick stable building on West 14th Street for the New York Biscuit Company. Astor commissioned Thomas R. Jackson to design the stable. By now Jackson was prominent among the city's architects. Born in England, he had worked in the offices of Richard Upjohn and was one of the designers of the rebuilt Trinity Church in 1839. For this project he turned to the Romanesque Revival style. Jackson avoided the chunky medieval columns and massive rough-cut stone arches popularized by Henry Hobson Richardson, relying instead on refined symmetry, shallow recesses and two three-story arches. Restrained decoration, like the eyebrows and sprandrels of the arches and the complex corbels below the triangular pediment were executed in brick. Even as his 14th Street building was being constructed, Astor attempted a bizarre final break with New York City. In the summer of 1892 newspapers received word that he had died from a sudden attack of pneumonia. Before long, however, his supposed death was exposed as a ruse to disappear from public view and William Astor was widely derided in the press. The stable was completed early in 1893. 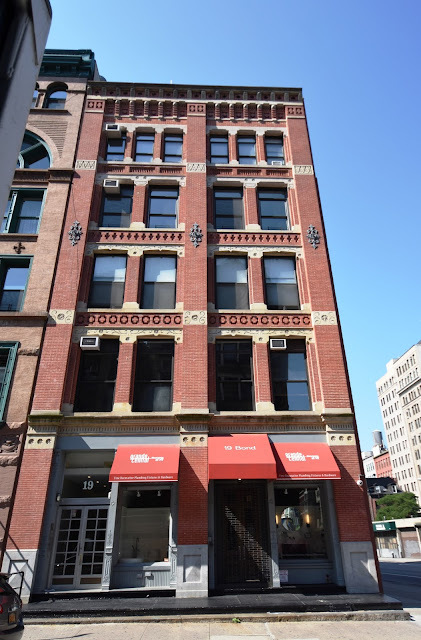 Astor had put contractor Hugh Getty in charge of construction On April 22, 1893, the Record & Guide said he had "an excellent record for first-class work" and noted "He has just completed the stables for the New York Biscuit Co., 14th to 15th streets and 10th avenue." The New York Biscuit Co. used the stable to house its fleet of drays and teams of horses. The same year that the firm moved in, King's Handbook of New York City called it "by far the greatest producer in the world of biscuits, or crackers." The well-chosen site near to the docks and railroads enabled efficient shipping. King's Handbook said "It supplies its widespread trade by means of teams, railroads and vessels; its products reach all civilized parts of the world." The bakery continued to grow by merging with its greatest rival, the American Biscuit Co, in 1898. That firm was nationally-known for its brand names Premium Saltine and Fig Newton. Brilliant national marketing and careful introduction of new products--like Uneeda Biscuit crackers--advanced its massive success. In 1919 National Biscuit began buying up the many properties in the area which it had been leasing from the Astor estate for so long. 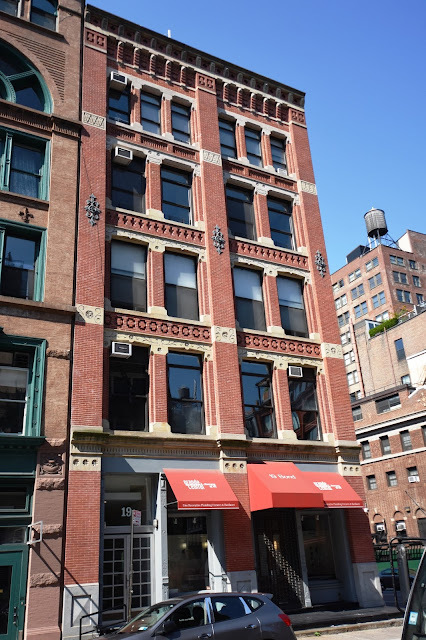 By January 20, 1920 it had not only purchased what was now described as the "three-story garage" on West 14th Street, but the entire square blocks from 15th to 16th Streets from Ninth to Tenth, and Tenth to Eleventh Avenues. The Real Estate Record & Guide placed the "total investment by the Biscuit Company in this location of about $10,000,000." The gritty neighborhood of warehouses, meatpacking factories and riverfront docks was the haunt of gangsters in the 1920s and '30s. On the night of January 29, 1937 Patrolmen Gerald Brandy and Charles Krouche were patrolling on West Street when they heard a gunshot. Seeing a large black sedan speeding along Washington Street, they pursued it in their radio car. The auto collided with a taxi, then veered onto the sidewalk and crashed into the National Biscuit garage. The left rear door flew open and a body rolled out onto the pavement. The unidentified man had been shot through the heart. A 29-year old female passenger, Mary Higgins, was taken prisoner to St. Vincent's Hospital with a broken arm, and the diver, 30-year old longshoreman James Lavin was taken to the Charles Street police station. Two days later detectives had identified the dead man as another longshoreman, 36-year old Ralph Clements. His police record reflected 14 arrests and several terms in Sing Sing. "He had been questioned in connection with the murder of the widow of Jack (Legs) Diamond three years ago in Brooklyn," noted The New York Times on January 31. Both Clements and Lavin, who had met in prison, were described by police as "petty racketeers." The Times reported "The police are trying to determine whether the two men had a dispute concerning their racketeering activities along the waterfront." How "petty" the men's criminal careers were was debatable. Lavin admitted he "had been sentenced to seven to fifteen years for killing a man in 1924; that he had escaped from Sing Sing; that he later had been arrested for robbery, and that he recently had been on parole." In 1941 National Biscuit Co. became Nabisco. By now it had added Oreo cookies and Animal Crackers to its extraordinarily successful list of products. The firm moved its operations to New Jersey in 1958, selling the former stables to the Industry City Realty Co. that year. 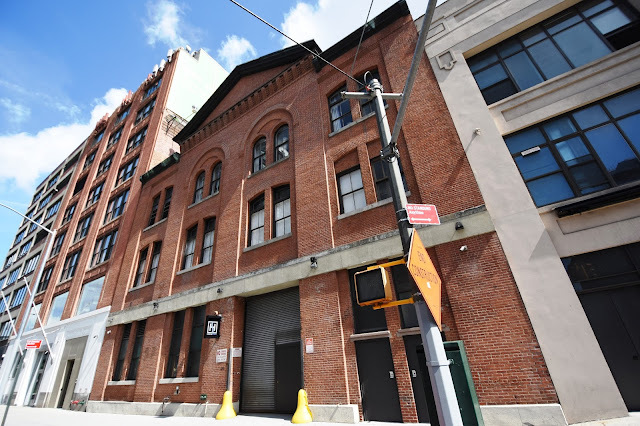 For years the impressive brick structure was used as a warehouse for companies like Saks & Co. As the Meatpacking District changed from warehouses and butchery firms to one of upscale shops and restaurants in the late 20th century, the building was purchased by Ceco Studios, LLC. in 1995. Behind the handsomely-restored facade, Ceco Studios operates the High Line Stages, touted as Manhattan's two largest sound stages. In 1850, when Peter Tostevin began his business as a builder, wealthy importer Lewis Baker lived at No. 19 Bond Street. Baker’s office was at No. 124 Pearl Street and he had lived in his wide mansion since 1833. Known popularly as “Looe,” Baker would remain here as late as 1854. Although Peter Tostevin was best known as a builder and contractor; for the Boutin & Smith project he would double as architect. It was most likely his last commission. The 52-year old died suddenly on December 8, 1879. In 1880 his business became Peter Tostevin Sons when Henry M. and Peter L. P. Tostevin took over their father’s firm. The five-story, neo-Grec structure was completed in 1880. Tostevin had designed a cutting-edge structure of red brick, trimmed with limestone. He brightened the often dour architectural style with florid incised carvings, carved rosettes and Queen Anne-inspired brickwork within the spandrels and the corbels below the cornice. Another school furniture manufacturer shared the building. 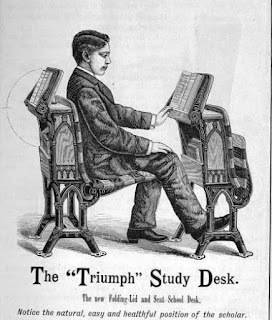 Baker, Pratt & Co. advertised “Apparatus and Furniture of all kinds for Schools, Academies, Colleges and Halls,” in 1881. But when the firm “dissolved by its own limitation” on December 31, 1884, it was taken over by A. H. Andrews & Co. The firm came under suspicion of corruption in 1886 when the School Board sought proposals “for fitting and furnishing the new grammar school house, No. 83” on East 110th Street. The specifications included carpeting, chairs, teachers’ desks, slates, pupils’ desks and other school necessities. Nathaniel Johnson, maker of church and school furniture at No. 490 Hudson Street underbid A. H. Andrews & Co. by several hundred dollars. But Andrews received the contract. 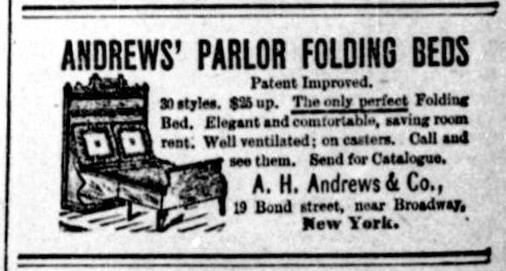 Despite the apparent success of A. H. Andrews & Co., the firm entered bankruptcy in the early 1890s. It was replaced in No. 19 Bond Street by textile and apparel related firms, like Hugo Maul & Co., dealers in “braids, chenilles, skirt cords, dress trimmings and tassels,” which was here in 1890. At the turn of the century the Manhattan Cloth Examining, Sponging, and Refinishing Works was in the top three floors. The second floor held the laundry operation of Wilck & Co. The sponging and refinishing firm utilized flammable liquids in its operation, and a fire broke out on the fourth floor on January 11, 1902. It was extinguished, but not before causing $2,200 damage. Two weeks later, on January 26, repairs were being made when, around 2:00, Engineer Mallon discovered another fire. On the third floor the bookkeepers and office staff were working, while other employees were on the top floor. One of them, Richard Crotty, was deaf. The fire quickly turned into a roaring blaze. As the workers scrambled to escape, Richard Crotty was unaware of the danger, unable to hear the cries of “fire!” The New York Times reported “When the smoke rolled up from the fourth floor he became bewildered, and was going to jump.” Luckily, his employer, John W. Fleck, realized he was still in the building and rushed back to rescue him. The corbels and cornice are a stunning example of the bricklayer's craft. The police were on their beats two years later; or at least Detectives Peabody and Clark were. At around 4:00 on the morning of October 21, 1904 they heard “soft whistles” coming from Shinbone Alley. The detectives recognized it as a common signal from a lookout to his burglarizing confederates. Just a few days earlier Gerson & Marks had been robbed of $3,000 worth of silks from No. 19 Bond Street. The 35 rolls of cloth they were preparing to steal were worth $2,500. The goods belonged to Gerson & Marks who had just been robbed. The Standard Electric Novelty Company was on the third floor in 1926. Every Saturday afternoon the firm’s payroll was delivered, a fact that came to the attention of three young crooks, Vincent Napolitano, James Diodato, and Frank Cerasani. Cerasani was just 17 years old, his accomplices were both 20. Around noon on Saturday, March 27 that year policeman Lewis Colton was at the corner of Lafayette and Bleecker “when his attention was attracted by the furtive actions of the trio,” according to The New York Times. He followed them to No. 19 Bond Street where they loitered around the doorway. When he approached them to asked what they were doing there, he noticed the bulge of a firearm in Napolitano’s waistband. Bond Street was filled with Saturday workers and “there was much excitement.” Another policeman arrived to find Colton fighting off the three thugs. Each of the would-be robbers carried weapons. Finally subdued, they admitted they were waiting to steal the Standard Electric Novelty payroll. Police vigilance paid off again on July 20, 1935 after 22-year old Joseph Sansone broke into the building by tearing loose boards away from the loading platform in the rear. After burglarizing the woolen goods firm of Gerofsky Brothers, he started to leave; but was spotted from the street. Trapped inside, he soon found the building surrounded by policemen. Ironically, it turned out that burglar was the son of barber Joseph Sansone. For two decades the senior Sansone had been the “favorite barber” of Herman Gerofsky, principal of Gerofsky Brothers. Despite being caught with stolen goods, Gerofsky refused to make a complaint against the young man. The last quarter of the 20th century brought further changes to Bond Street and the Noho neighborhood in general. In 1989 No. 19 was converted to joint living and working quarters for artists. The struggling artists who lived in the building then would surely be unable to make the $10,000 per month rent necessary to lease the penthouse in 2014. Peter Tostevin’s handsome façade survives wonderfully intact since the days when cast iron school desks were assembled here. On January 4, 1791 a group of eminent citizens, whose surnames would forever be linked to New York, joined in a noble project. Among them were Isaac Roosevelt, Robert Livingston, James and Federic De Peyster, Robert Remsen,, James W. Beekman, and John Watts. The men drafted a constitution and by-laws for a New York Dispensary, "for the care of the sick poor of the city." 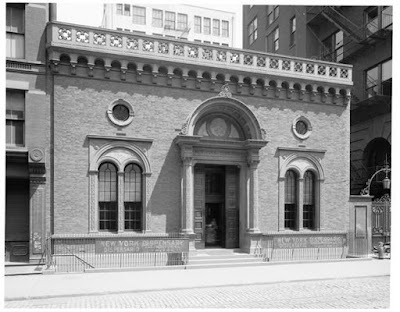 The New York Dispensary was incorporated on April 8, 1795 and began its work in a one-room building on Tryon Street, later renamed Tryon Row. The only dispensary in the city, it was receiving 10,000 patients per year by 1828. On May 6, 1857 The New York Times described the wretched neighborhoods served by the organization. "In the district served by the 'New-York Dispensary,' are included some of the most dangerous portions of the City--the Five Points, and the waterside on both our eastern and our western limits, below Spring-street, and Pike-street...That these most dangerous quarters of New-York are also the most suffering quarters of New-York, that these crowded and filthy streets which invite death from abroad are the homes also of misery without a name." The article noted "Within these limits swarm some hundred thousand human beings, whose sanitary condition may be roughly inferred from the fact that more than twenty-five thousand of them annually appear as patients at the Dispensary, while over fifteen thousand annually required the services of the Dispensary physicians at their homes." That number was more than tripled by the end of the Civil War. Doctors treated more than 100,000 patients either in the clinic or in their squalid tenements. The old building was razed and replaced in 1868 with an impressive $70,000, four-story dispensary at Centre and White Streets. For more than four decades the New York Dispensary remained here, treating more than 100,000 indigent patients yearly. 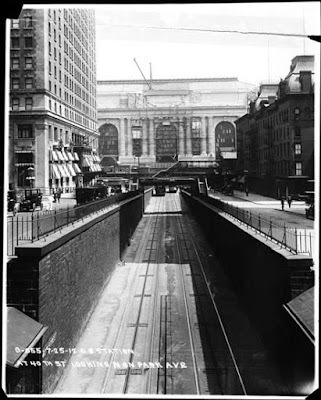 Then in June 1908 it was forced to move when the City took the property through eminent domain for the building of the subway. 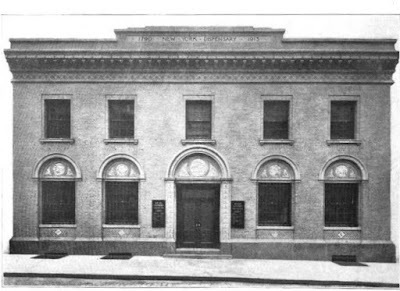 The esteemed architectural firm of Trowbridge & Livingston designed the new New York Dispensary building at Nos. 145 and 147 Worth Street. The handsome $25,000 structure was opened on September 15, 1909. Almost unbelievably, a year and a half later the City claimed that property as well. The New York Times wrote "'Move on!' Twice has the city issues this command to the old New York Dispensary in the past five years...And now like a Nemesis comes the city again saying, 'Move on! I need your land for improvement purposes, a park and new municipal buildings.' So the dispensary is obliged to gather up its skirts a second time an decamp." The New York Dispensary sat on land wanted by the City for the construction of the new Courthouse. In June 1912 the two plots at Nos. 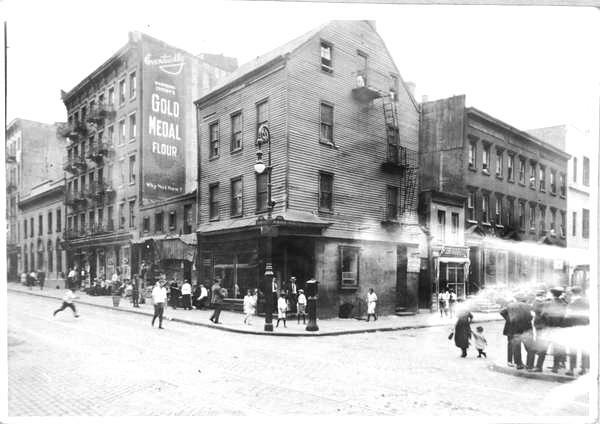 34 and 36 Spring Street between Mott and Mulberry Streets being used as a coal yard was purchased. The Times described the neighborhood as a "thickly populated tenement house district" and added "A two-story building, fully equipped for all dispensary uses, will be erected from plans by Trowbridge & Livingston." In a later article, the newspaper remarked "It has been facetiously suggested that its new building in Spring Street be placed on wheels, so that at the next municipal demand the dispensary can comply with less expense to itself." The expense of a new building--before the last one was even paid for--was a crushing blow. 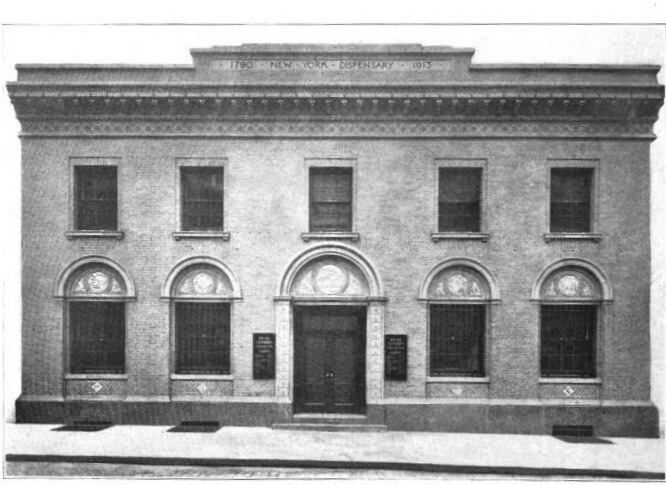 The New York Dispensary relied entirely on private donations to operate. The American Contractor listed the cost of the newest structure at $25,000--about $630,000 in 2016 dollars. Trowbridge & Livingston's beige brick villa design was a less-elaborate version of its previous Dispensary. Little expense was given to unnecessary decoration to the no-nonsense, two story structure. The blind arches above the first floor openings were inset with marble; but otherwise cost-saving brick and terra cotta made do for the lintels and cornice. Nevertheless, the handsome Italian-style edifice was an architectural anomaly among the brick tenements and old frame structures along the block. On November 16, 1913, the day before the new Dispensary opened, The Times reminded its readers that "From 400 to 600 patients receive treatment daily, and to defray the expense of this work the Dispensary is dependent almost entirely on the contributions of the public." Among the Dispensary's ardent supporters was Mrs. George Jay Gould, who annually ensured that there would be temporary joy for the poverty-stricken children at Christmas. The first year the Dispensary was opened she sent well-needed gifts to 75 little boys and girls. The New-York Tribune wrote "No one knew for several days who it was that gave them their sweaters and mittens and had them delivered at the institution anonymously." A "Christmas entertainment" sponsored by the Dispensary's social service department was held the day after Christmas, prompting The Sun's headline "The Late Mr. Santa There." One of the medical staff, Dr. Merriam, dressed as Santa Claus and distributed presents to 500 children who enjoyed "the songs and recitations as they munched candy, cake and oranges." The Sun opined "The entertainment was a jolly one." The Dispensary was a clinic--not a hospital--and on rare occasions that difference caused problems. Such was the case on January 21, 1915 when Mrs. Clara Smith was petting one of her three cats in her home on Renwich Street. Suddenly the pet bit into the index finger of her left hand. She went to the New York Dispensary and was treated for the small wound. Then 11 weeks later she was removed to St. Vincent's Hospital where, coincidentally, her 12-year old daughter Katharine was already being treated for pneumonia. Dr. William W. Cox examined her, and diagnosed her throat spasms, intervals of rigidity of the body and jaws, and related symptoms as rabies. The doctor visited the Renwich Street home, where he found the cat crouching in the corner, hissing and baring its teeth. "I ordered it crated up," he told reporters. The importance of home visits was exemplified in the report of the Crippled Children's East Side Free School in 1918. It reported "For the reception of cases requiring closer attention than is possible in a day school the New York Dispensary is open without cost. In a single year the surgeons and physicians have paid nearly 500 visits to the homes of pupils." The Dispensary's own Annual Report for 1923 showed that 5,789 patients had received dental care, 92,890 prescriptions had been filled, and 40,520 patients had been treated in the clinic. Another 3,757 patients had been visited in their homes. The report proudly boasted that "The grand total of patients treated since its foundation in 1790 now amounts to 4,944,822." A change had taken place, however. Most patients now paid 10 cents toward their treatment. "In the beginning it was a free Dispensary caring for the destitute," noted the Report. "As the years have gone by, the destitute have been more and more cared for by the State and City Institutions and are supported by us all when we pay our taxes. Although the New York Dispensary still cares for many cases free of charge...it has gradually become an institution used chiefly by those who, while too poor to pay a private doctor, can pay a small amount for medical treatment." The blue collar patients had difficulty visiting the Dispensary during working hours. As a solution evening clinics were established here in January 1936 "for the benefit of low-salaried persons who may receive treatment at a nominal cost." The cost was, indeed, nominal. Visitors to the evening clinic, which was opened from 5:00 to 7:00 on Tuesdays and Fridays, were charged 50 cents. Patients to the day clinic were charged 25 cents by now. In 1949 the New York Dispensary merged with the New York Infirmary. The move would result in the closing of the Spring Street clinic as the combined facilities opened at No. 321 East 15th Street. The Spring Street neighborhood reacted with a law suit. On August 15, 1949 The Times reported "A group of East Side residents is taking action to prevent the 150-year-old institution from closing its doors next Thursday...The basis for the suit, according to a petition by the residents, is that 'the sick, indigent poor served by the dispensary have a vested right in and to the benefits for which the dispensary was founded." The group demanded that the consolidation either be voided, or that the consolidated institutions be forced to maintain a dispensary at the Spring Street location. A satisfactory solution came in the form of the Judson Health Center, founded in 1921 in affiliation with the Judson Memorial Church on Washington Square. The Center had been at No. 237 Thompson Street; but now, responding to a petition signed by 6,000 residents, it spent $35,000 to buy the vacant Dispensary building, and another $30,000 in renovating it. On October 25, 1950 as renovations were nearly complete, The Times reported "Mothers wheeling baby carriages congregated in talkative groups yesterday before the building at 34 Spring Street, between Mott and Mulberry Streets. They watched workmen chip away the stone legend 'New York Dispensary' above the door and prepare to put up painted bulletin boards reading 'Judson Health Center.'" The Center still operates from the Spring Street building, more-or-less a neighborhood walk-in clinic. While the neighborhood around Trowbridge & Livingston's attractive brick structure has greatly changed, the 1913 New York Dispensary building has not. 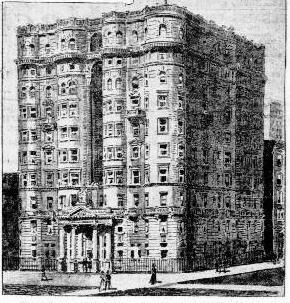 On October 15, 1900 the newest apartment house on Central Park West was ready for occupancy. Designed by architect George W. Keister it rose ten stories on the southwest corner of 92nd Street. The Central Park West facade was a cluster of rounded bays, affording each apartment expanded views of the park and increased cross-ventilation inside. The upscale Ardsley Hall contained 43 suites of from six to 12 rooms, not including bathrooms or pantries. The largest suites boasted three bathrooms. The up-to-the-minute amenities included private telephones, electric lighting and individual "refrigeration plants." An attractive feature was the "special entertainment rooms" available to the tenants for large entertainments or balls. Tenants paid from $1,500 to $3,800 a year for the apartments. The most expensive rent would equal about $9,250 per month today. But Edwardian fuss quickly fell from favor as the Jazz Age took over Manhattan in the 1920s. Central Park West would be transformed by the construction of sleek Art Deco apartment houses which replaced the older buildings. Among the first to go was Ardsley Hall. On August 8, 1928 the announcement was made that within the past six months Samuel Barkin & Sons had acquired Ardsley Hall, along with Nos. 4, 8 and 12 West 92nd Street. The builders planned to erect a 20-story apartment house on the plot. "This will be the largest housekeeping apartment building on Central Park West," Samuel Barkins said. The entire project was estimated to cost about $4.5 million--more in the neighborhood of $62.5 million in 2016. The New York Times noted "This project will necessitate the demolition of the ten-story Ardsley Hall apartment, one of the first of a group of tall apartments erected opposite the park, and three five-story flats." The newly-formed Central Park West & 92nd St. Corp. was, no doubt, staggered by the onset of the Great Depression a year later. Nevertheless, the massive project went ahead, with ground broken in 1930. A year later, in the fall of 1931, the Ardsley was ready for occupancy. The developers had chosen architect Emery Roth to design the 22-story structure. Separately, he and Rosario Candela were perhaps most responsible for changing the streetscapes along Central Park in the 1920s. Even during the Depression years Manhattan's wealthiest citizens spent lavishly. On April 5, 1931 The New York Times reported that a "good rental season [is] indicated for new apartments." The article focused on six new luxury buildings, including the Ardsley. In 1916 New York City had imposed the Zoning Resolution which required buildings to include setbacks in order to allow light and air to the streets. The resulting stepped high rise buildings drew comparison to ancient ziggurats. Emery Roth took the concept a step further by decorating the Ardsley with Mayan decorations executed in black brick within the beige facade. The result was a masterpiece of Art Deco design. Horizonal balconies and banding were contrasted and balanced by vertical lines, some which suddenly jutted off at right angles. 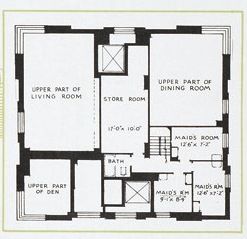 Saying that The Ardsley was ideal "for those wishing an atmosphere of country life with convenience of the City," agents boasted "included in the appointment are over-sized rooms, wide windows, venetian blinds, exceptional closet space well equipped kitchens, glass enclosed showers, and trained employees to maintain the finest...standard of service." The Ardsley was designed with tenants of varying incomes in mind. While some of the apartments had commodious bedrooms, living rooms and "galleries," they had no servants' rooms. In contrast were the sprawling multi-level apartments of the topmost floors. 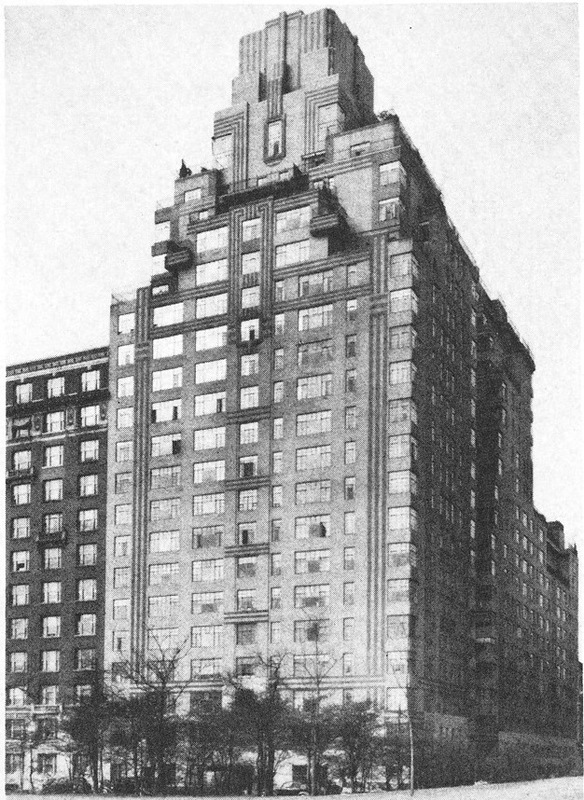 The 11-room triplex on the 21st through 23rd floors had a wrap-around terrace on the 21st floor, and two terraces on the 22nd floor. There were 15-foot ceilings and a wood-burning fireplace in every room. 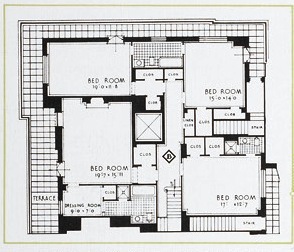 The 23rd floor was "completely separated from the master section" and included three maids' rooms and a bath. The Ardsley filled with well-heeled residents, not all of whom were on the up-and-up. Corporate attorney Aaron Sapiro moved here from Chicago after things got a little heated there. Sapiro was counsel for several Chicago labor groups run by underworld thugs. On July 27, 1933 he was arrested in his 20th floor office at No. 521 Fifth Avenue. Police had received a telegram from the Illinois State Attorney's office saying Sapiro was a fugitive and was under indictment on a charge of "causing the explosions of bombs in buildings in Chicago and also causing bodily harm to different people." The attorney was met with a crowd of press photographers at Police Headquarters. As their flashbulbs snapped, Sapiro reacted with sarcastic coolness. "I'll pose," he said. His smug attitude was relatively short-lived. The bad press was apparently not good for business and on June 7 the following year he filed for bankruptcy, listing liabilities of $181,000 and assets of $14,425. Court papers showed he placed a value of $300 on his "wearing apparel and books." In the meantime, things were not going so well for the Ardley's owners, either. On September 11, 1933 the building was sold in foreclosure actions. The Manufacturers Trust Company took over the property with the only bid--$2.575 million. The memories of the terrifying Lindbergh baby kidnapping two years earlier were vivid in the minds of all wealthy parents in 1934. So Benjamin Feldman was understandably shaken when he opened a letter on May 17 that year. In it the writer said that unless Feldman paid $500 his wife would be kidnapped. Exactly one week later a second letter arrived, this one saying that both his wife and seven-year old son would be taken and both murdered. Detectives were put on the case and arrangements were made to hand off a package containing the ransom in the Times Square subway stop. When 23-year old Nicholas Garafola took the package from the undercover detective on May 25, he was immediately arrested. Garafola had been a shipping clerk in Feldman's employ. The New York Times reported "Garafola said he needed the money to pay off debts and insisted that he had no intention of carrying out his threats." Among the residents at the time were retired Deputy Chief Inspector Dominick Henry of the New York City Police Department, and his wife, the former Mary Gertrude Crittenden. Henry had changed the entire complexion of Manhattan traffic by instituting the one-way street system, and by installing the first traffic lights. He also implemented parking restrictions. The Times would later credit him with unsnarling "the tangle of vehicles that clogged the streets in the early Nineteen Twenties." Mary Henry was highly educated, having attended the College of New Rochelle and Columbia University. Her health began failing around 1937, and she died in the couple's Ardsley apartment at the age of 59 on February 24, 1938. Dominick Henry lived on here for another four years, dying after an illness of several weeks on Saturday, February 1, 1942. The funeral for the 74-year old former Inspector was impressive. On Saturday morning of February 3, 117 foot patrolmen assembled in front of the Ardsley. They, along with the Police Department band and Color Guard, escorted the body to the Catholic Church of St. Gregory the Great on West 90th Street. The Ardley's most celebrated resident at the time was lyricist Lorenz Hart, who had signed a lease on a massive 17-room penthouse on August 4, 1939. Half of the Broadway songwriting team of Rodgers and Hart, his lyrics to standards like "Blue Moon," "The Lady is a Tramp," and "Bewitched, Bothered, and Bewildered" were famous. Hart shared the apartment with his widowed mother, Frieda. Tortured in his personal life, he suffered from alcoholism and depression and was anguished by his secret homosexuality. His mother took the upper floor of the duplex while he lived below with an expansive terrace. His biographer, Frederick Nolan points out in his 1994 Lorenz Hart: A Poet on Broadway, "Immediately after moving in, Larry had a huge, heavy, soundproofed door installed between the two floors, so that Frieda should not be disturbed by any late-night revelries below." On Easter Sunday 1943 Frieda Hart died. Shortly afterward Lorenz Hart left the Ardsley and moved into a small penthouse on Park Avenue. He died there on November 22 that same year. A service door reflects Roth's attention to detail. World War II affected everyone in the Arsdley, as it did all Americans. On September 18, 1943 Jerome C. Simpson was awarded the Distinguished Flying Cross in Washington DC. A much different sort of notoriety came to 32-year old dress manufacturer Martin Asnin two months later when he was imprisoned for draft evasion. And 51-year old William S. Orkin was disgraced when he and seven cohorts were found guilty of a racket "in the guise of aiding wounded war veterans" at a hearing on February 18, 1946. The gang sold subscriptions to a fictitious magazine, the Army and Navy Hospital Visitors. The District Attorney was clear in his disgust, saying "This is a particularly despicable species of fraud--exploitation of the public sympathy and admiration for wounded veterans of war." 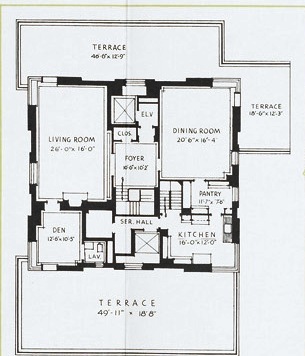 The two-story penthouse that had been home to Frieda and Lorenz Hart was taken by Elliott Gould and his new bride, Barbra Streisand in 1963. 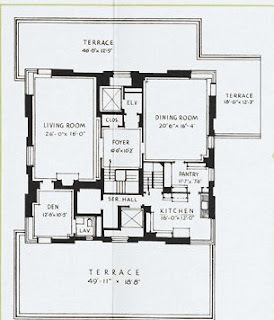 In her My Passion for Design the entertainer wrote that the apartment had "an elegant staircase, two fireplaces and a terrace--quite a change from a railroad flat." In fact there were five fireplaces and seven and a half baths. The couple had one son, Jason, while living here. The Gould-Streisand divorce was finalized in 1971; but Streisand had already looking for a new home. On May 3, 1970 The Times noted "Barbra Streisand is back in the market for a place to live." The article said "Miss Streisand, who was unavailable last week for comment on her housing problem, is said to be looking for a cooperative on the East Side. She now lives at 320 Central Park West with her son, Jason. She and her husband, Elliott Gould, are separated." Part of the star's difficulty in finding a new residence was her reputation--not for noisy entertainments, but for being difficult. Steven Gaines explained in his The Sky's the Limit: Passion and Property in Manhattan, "she never gave parties and hardly ever entertained. In fact, she would have been a model tenant at the Ardsley had she not earned a reputation as the building's chief kvetch and critic, for whom nothing was quite good enough, including the way the lobby was decorated." In July 1998, 28 years after Barbra Streisand began looking for a new house or apartment, she married 57-year old actor James Brolin at her Malibu, California home. She immediately listed the Ardsley penthouse at $10 million. The New York Times Home & Garden journalist Tracie Rozhon noted it included "a media room and an unpretentious hairdressing salon." It seemed to be sold when 29-year old pop singer Mariah Carey offered $8 million cash and Streisand accepted. But the co-op board was less eager to close the deal and rejected Carey as a tenant. Reportedly Streisand was irate, telling the press "If an artist can't live on the Upper West Side, where can they live?" She finally settled for a $4 million offer, precisely half the amount Carey was prepared to spend, from a single woman who was approved by the Board. In 2010 a two-year restoration of the Art Deco lobby was completed by designer Scott Salvator. 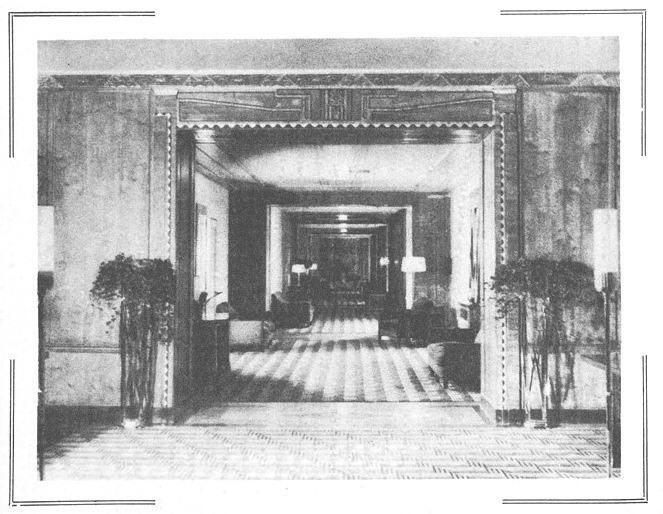 Although he rarely accepted lobby designs, telling Fred A. Bernstein of The Times he "disliked working for committees;" he jumped at the Ardsley project because it was an Emery Roth work, and "it is pure Art Deco." Salvator said he found the style uplifting. During tough times, he said, "If you're going to have something awful, like a war, you at least want someone dancing down a stairway in a tux." Repairs made with non-matching brick disturbs Roth's the black-and-beige scheme. The Art Deco motifs, nevertheless, spectacular. The magnificent Mayan-Art Deco Ardsley continues to house wealthy businessmen and celebrities. In 2012 actor David Duchovny entered into contract for a $6.25 million three-bedroom apartment on the 19th floor. Among the several massive Art Deco apartment buildings along Central Park West that compose its famous streetscape, the Ardsley is a masterpiece.